As summer comes to a close and we welcome our chilly fall weather, let's take a look back at what came out in September. Pick up these new releases, perfect for cozy autumn game nights at home, at your friendly local game store! 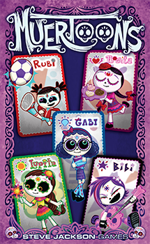 You and your friends are looking for the Día de los Muertos celebration. But grumpy Tio Rico hates the noise and lights of Día de los Muertos, so he stole the signs pointing to the party. Luckily, the Muertoons can show you the way. Play the numbered cards in the right order; the first person to discard all their cards leads their friends to the celebration! Legendary Munchkin loot for the biggest treasure seekers! 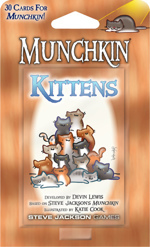 Are you a Munchkin collector? 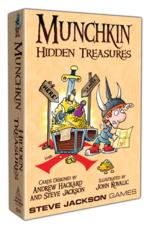 Then you need Munchkin Hidden Treasures. It's packed with hard-to-find promos and card packs once available only on Warehouse 23. The shadows are insatiable, the odds are insurmountable . . . but your determination is unstoppable! 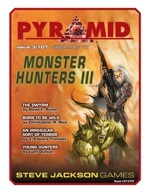 This issue of Pyramid, the PDF magazine for roleplayers, adds new options and threats to GURPS Monster Hunters. Take arms against implacable ghosts with strange abilities. Battle a cosmic horror from beyond the edge of reality. Unleash new wildcard skills and options to speed up gameplay and amp up the champions' abilities. With this issue, the threats are deadlier, but the heroes are more prepared than ever! Where peace and tranquility lead to peril and treasure. The tavern rumors promise adventure; the beacon in the dangerous wilderness promises respite; both are correct, and both lead to an abandoned monastery. The Pagoda of Worlds is an ancient spiritual retreat holding many secrets and hazards for GURPS Dungeon Fantasy heroes . . . including a gate to other realms. 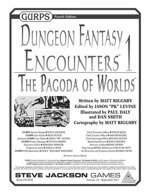 GURPS Dungeon Fantasy Encounters 1: The Pagoda of Worlds provides a ready-to-use, detailed adventure outline, maps, new monster stats, and tips for adjusting the difficulty of events based on party size and composition. Open your mind, ready your sword, and prepare for battle; worlds await! Your computer is the new home for Ogre. With the release of Ogre on Steam, you can join the fight from your own computer. So why not deck it out with Ogre gear? Created by Auroch Digital, these wallpapers come in a variety of cool designs, some showcasing digital art from the game, some with the classic Ogre silhouette. We even have wallpapers for your phone! Upload these images to your desktop and prepare to fight The Last War. Which clearly explains what happened to them. Cats may be cute, but they've got teeth, claws, and . . . siege weaponry? Munchkin Kittens has 30 more cards that some of you may be allergic to. Don't be fooled - they're adorable, but deadly! Drawn by the amazing Katie Cook, this mini-expansion has been out of print for a while, but is back . . . until it sells out again! Make sure to pick yours up today! Hipsters adds 30 cards that will let you defy The Man while wearing your Knit Cap and sipping on your Nonfat Soy No-Whip Skinny Half-Caf Fair Trade Ventitré Mocha Latte. Even though it's so last year, you can fight the Indie Band using your Artisanal Chunky Black Glasses and go up a level when you Reject the Conventional. Hipsters was one of our most popular mini-expansions, but now that it's back in print, it's vintage, so now it's cool again. 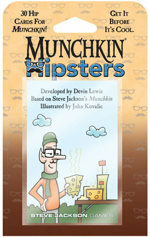 This is an expansion for Munchkin. It is not a stand-alone game. This is NOT a collectible or randomized set. Every Hipsters pack is the same as every other. You are a zombie. You want braaains. More brains than any of your zombie buddies. 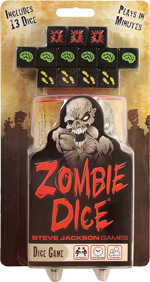 Zombie Dice is fun for any zombie fan (or the whole zombie family). The 13 custom dice are your victims. Push your luck to eat their brains, but stop before the shotgun blasts end your turn! 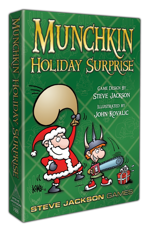 We've created several holiday-themed Munchkin mini-expansions over the years. Now you can get 68 of those cards in a single set, including four new ones created just for the Holiday Surprise! We've also included two festive Christmas Munchkin dice and a special holiday Munchkin Kill-O-Meter to track your combat, because of course the holidays are all about bashing monsters and taking their stuff . . .